Our new, exciting 528 Water Imprinter/Colloidal Silver Generator is the most unique colloidal silver generator and frequency imprinting device in the world and is now available following several years of research and development. Over the years, our customers have asked us for a simple, effective, and portable device to make colloidal silver and imprint water and other liquids with harmonious energy and frequencies. 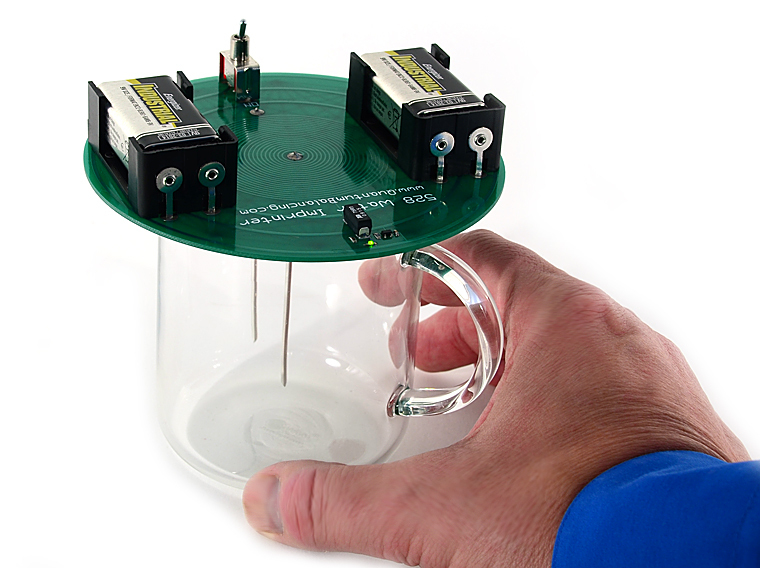 The 528 Water Imprinter/Colloidal Silver Generator was designed and developed to not only make high quality colloidal silver, but to also imprint harmonious frequency patterns into water and other liquids. Researchers now believe that the frequency of 528 Hz is central to the mathematical matrix of creation. This frequency, more than any other, is said to epitomize the unified field of musical metaphysics in the matrix of the spiraling fractal universe. According to scientists and spiritual practitioners, everything began with sound, or vibrational frequencies, acting on water. Water is the ideal superconductor for transmitting radiant energy. The 528 Water Imprinter/Colloidal Silver Generator is beautifully constructed of quality materials and components, and makes it easy to make highest quality colloidal silver for pennies per ounce. It is small, lightweight, and compact - making it ideal for traveling. It can be carried easily and can be operated anywhere in the world. 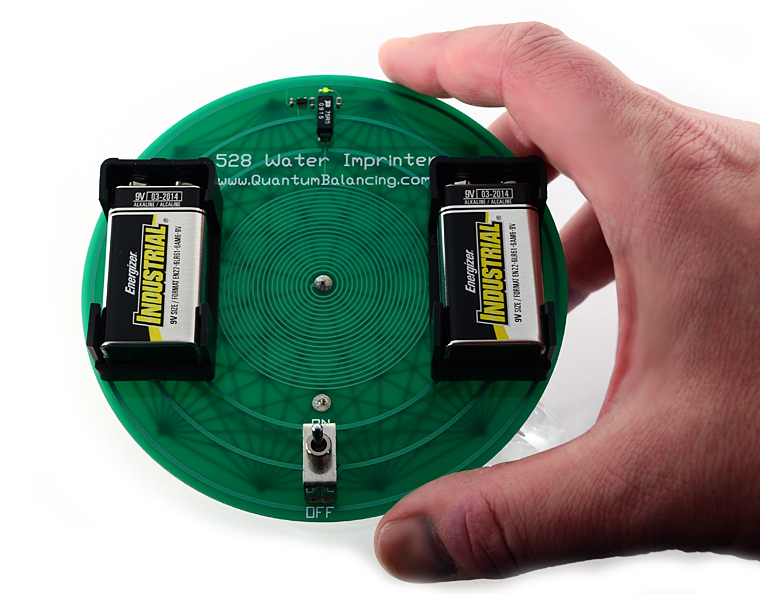 The 528 Water Imprinter/Colloidal Silver Generator operates on two 9-volt batteries (included) which last for weeks and/or months, depending on usage. The batteries are standard size and are available anywhere in the world. The two silver electrodes are made of heavy 12-gauge silver wire, are 3 inches long, and made from .9999 silver (called "quad 9"). That's the highest grade silver available anywhere. 528 Water Imprinter/Colloidal Silver Generator making high-quality colloidal silver! The photo above shows the 528 Water Imprinter/Colloidal Silver Generator making high-quality colloidal silver. The design process has given careful attention to the principals of sacred and ancient geometry. SO EASY TO USE! Remove the black plastic safety cap from the battery terminals on each of the two batteries. On the top side of the Imprinter, carefully insert the two 9-volt batteries into the two battery holders. Then on the bottom side of the Imprinter, carefully plug the two 3-inch silver electrode wires into the two jacks (one red, one black). Fill a clear glass with 4 to 8 ounces of warm, distilled or purified water, leaving at least 1" empty space between the top of the water and the rim of the glass as shown in the photograph above. 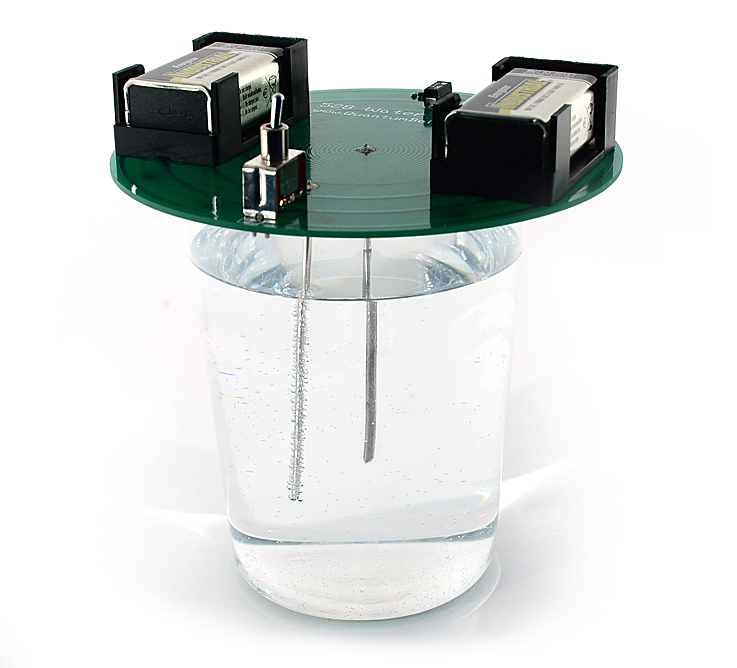 Then carefully place the Imprinter on the rim of the glass with the electrodes immersed in the water as shown above. Turn the switch to the "ON" position. 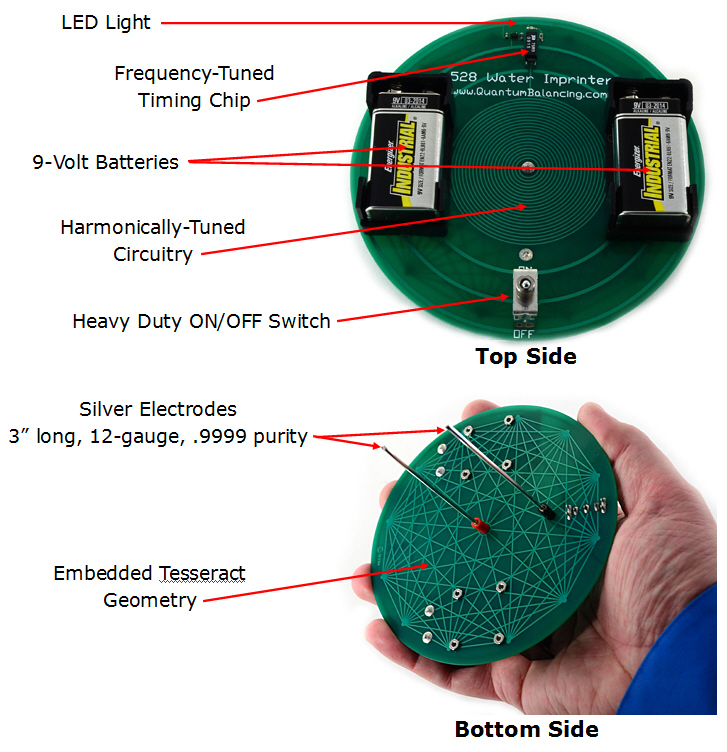 The small green LED light will indicate that the batteries are good and the unit is operating. Very soon the two silver electrodes will begin to give up molecules of silver which are caught in solution. One silver electrode will show bubbles accumulating on its length. The other silver electrode will give off whispy clouds. This process will begin to make the water shine, an indicator that colloidal silver is being generated. Within 10-20 minutes, the glass of water will have 5 to 20 ppm colloidal silver which has been energized with harmonious frequencies. 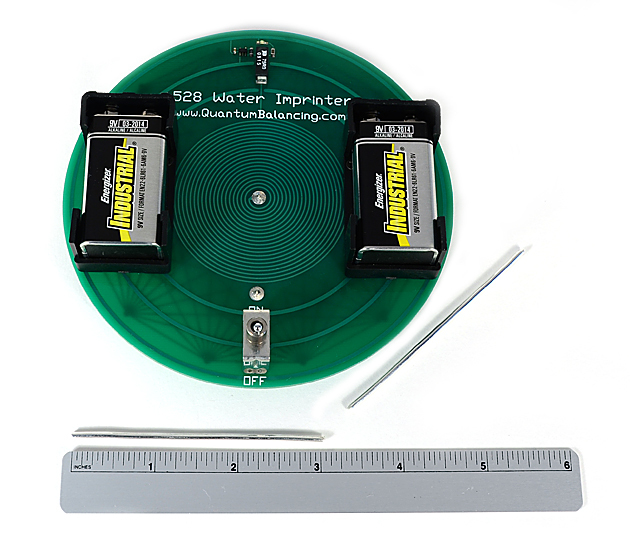 The 528 Water Imprinter/Colloidal Silver Generator Package includes the 528 Water Imprinter/Colloidal Silver Generator, two 9-volt Batteries, two Silver Wire Electrodes (3" long, 12-gauge, .9999 purity), Instructions, and free Shipping & Handling in the USA. Copyright © 1996-2012 EMR Labs, LLC. All rights reserved. Void Where Prohibited.